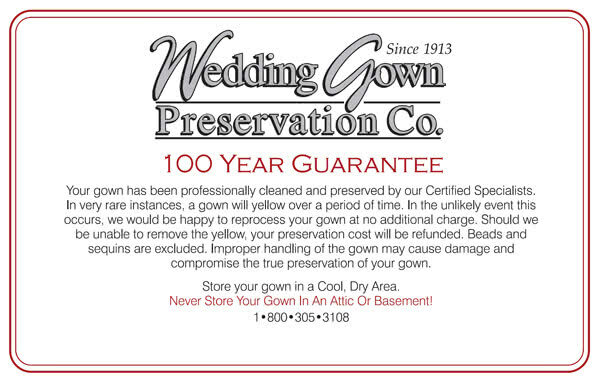 With your wedding dress cleaning and preservation, you'll receive a 100 year guarantee against the future yellowing of your gown. 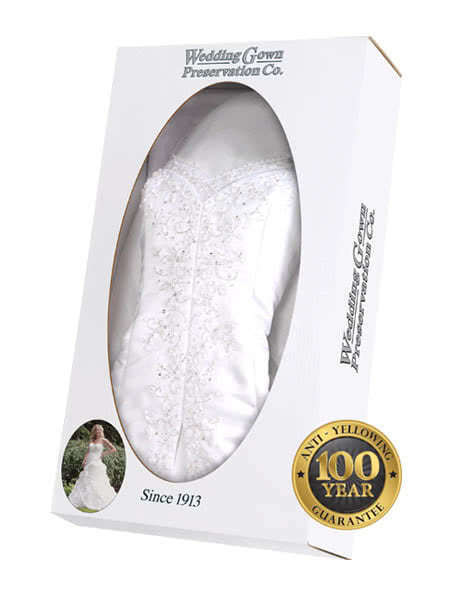 Your gown has been professionally cleaned and preserved by our Certified Specialists. In very rare instances, a gown will yellow over a period of time. In the unlikely event this occurs, we would be happy to reprocess your gown at no additional charge. Should we be unable to remove the yellow, your preservation cost will be refunded. Beads and sequins are excluded. Improper handling of the gown may cause damage and compromise the true preservation of your gown. Store your gown in a cool, dry area. Never store your gown in an attic or basement! Download a PDF version of the guarantee.